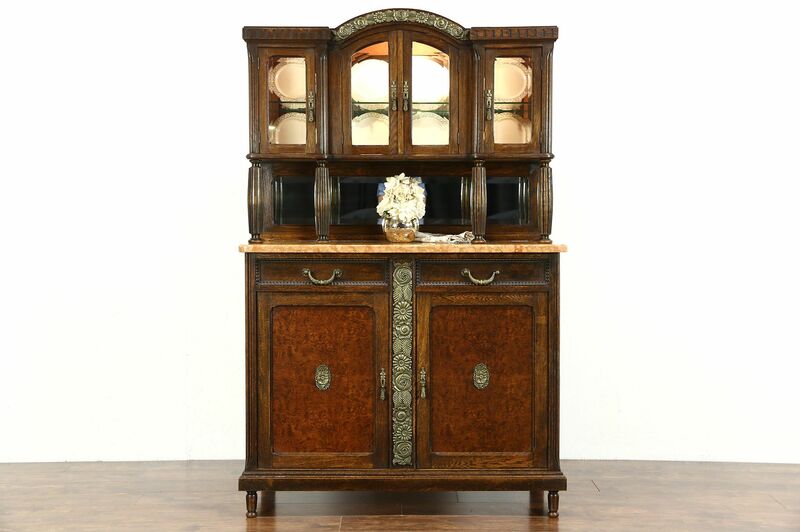 A striking Art Deco period marble top server, sideboard, china or bar cabinet was crafted in Belgium about 1920. The original finish is very well preserved on oak, accented with burl panels. Waxed and buffed, all that is needed to maintain its warm luster is an occasional wipe with a soft dry cloth. The original salmon marble top has been polished and sealed to resist stains. Glass panes are beveled, a key works the door locks. Cast and patinated bronze mounts and hardware are original on this antique furniture. The upper section is removable for easier delivery. Measurements are 49" wide, 22" deep, 77" tall and the marble is 41" high.